From time-to-time, we'd like to take a look at historic writer's rooms—the place where a writer's thoughts and ideas take hold. 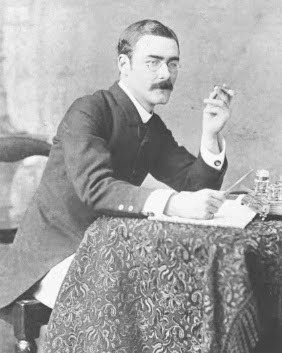 Here sat Rudyard Kipling, at his simple desk made of French walnut on an Indian carpet. This room was in Kipling's Jacobean-style house called, Bateman's in East Sussex—bought in 1902. In his autobiography, Kipling described his desk as being "ten feet long from North to South and badly congested." The typewriter was Kipling's least favorite piece of writing equipment. He felt that "the magic lies in the brush and the ink"—the desk is subsequently covered in black ink stains. Click on photo above to hear Ralph Fiennes read Kipling's poem, My Boy Jack. 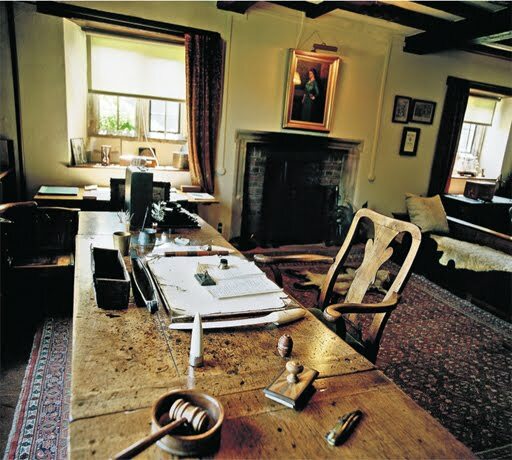 Neat idea to check out the writing spaces of famous authors!